Filter mounted between the LPG injections set and reducer. High quality filter paper effectively stops almost all solid contaminants with diameters of about 2 μm, protecting gas injectors. Regular filter replacement every 10-15 thousands km ensures adequate lifetime of the entire LPG installation with the vehicle. 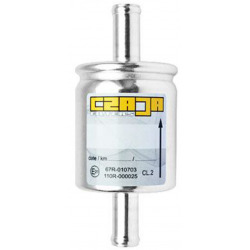 The vapour phase filter is of particular importance to the operation of gas injectors and has a direct effect on preventing the firing of valves in the engine head. Clean gas injectors can deliver identical portions of gas to individual cylinders and this has a direct impact on the proper engine operation parameters and the process of its consumption.